27, Jalan Kubis, Taman Goodwood, Off Jalan Kuchai Lama, 58200 Kuala Lumpur, Malaysia. KUO FONG SDN. BHD. 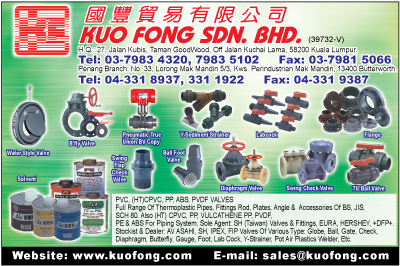 was established in a humble manner in 1978 with the sole objective in dealing with thermoplastic pipes, fittings, valves and other thermoplastic related products that using material such as PVC, cPVC, PP, HDPE, Vulcathene PP, ABS and etc. These products are ideal material for chemical industry, water supply, building and interior ventilation for air and gas, agriculture irritation, fishery for sea and fresh water. The high durability of thermoplastic that made to withstand corrosion, chemical, weather, shock and heat proof has resulted in expanding usage for many areas. Seeing the great opportunity and bright future of these product, we put all effort in providing the best service to our customer and are able to develop into a large-scale trader in the local market and the international as well. In order to serve our northern Malaysia customers even better and efficiently, we expanded our business by opening the first branch in Butterworth in June 1990. With more than 20 years of experience, we have not only been able to achieve ourselves as first class dealer of the major manufacturers but also a leading importer of major manufacturers of overseas, such as Japan, Taiwan, USA, Europe, etc. Our major marketing strategy is to serve our customers to full satisfaction and in order to achieve this, we maintain at all time good stock level with full range of standards of our varieties of items to ensure our customers that our sales premises offer 'One-Stop' service of thermoplastic; for whatever application you may have named it. In order to keep ourselves abreast with the ever- changing business world, we always avail ourselves to the up-dated information surrounding us. Hence we take a further leap to thermoplastic world by launching our official web site to serve our customer better. Here we would like to take the opportunity to show our deepest gratitude and thanks our long-term customers for their full support.